This is an exclusive, private wine tour for 2 people lead by an expert in the Willamette Valley Wine Region. Your day will be scheduled just for you and suited to your style and preferences. 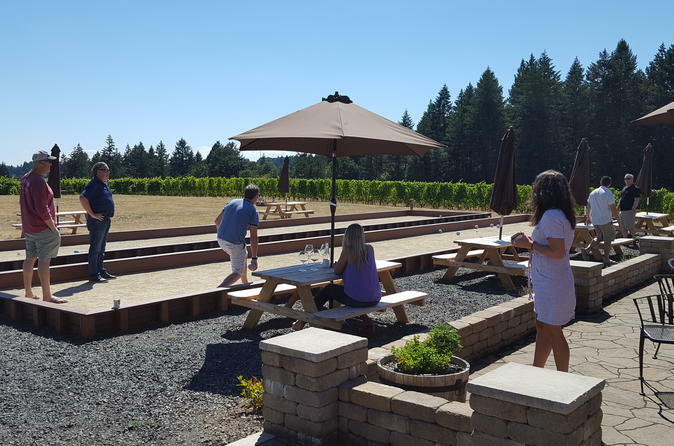 Relax and enjoy your all day Willamette Valley Wine Tour. Whether you are a wine tasting veteran or a newcomer, there is something for you to enjoy on this tour. The Willamette Valley is so well populated with quality wineries that it can be overwhelming for some to choose exactly which ones to visit. Let experts guide your way from winery to winery, as they fill you in on the dense and intriguing history of the Willamette Valley wine scene.The guides are expertly trained in the ways of the Willamette Valley and its many vineyards, and they will usher you to 3-5 vineyards and wineries over a 7 hour period. Here you will have the opportunity to taste the famous Pinot's, Chardonnays, Rieslings, and other varieties that are well-known throughout the region. You may even meet a winemaker along the way. This is the only company in the Portland area that is certified to send your wine home for you! Join an intimate and personal wine experience in the lush Willamette Valley. Book your Willamette Valley Wine Tour today!